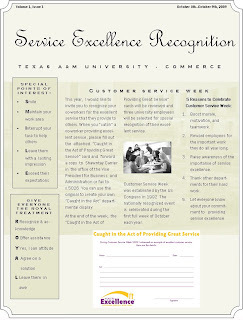 This is Customer Service Week at my university, and in great marketing fashion--underscored by that enlightened tendency to define higher education within certain business models--the powers that be have created a flyer that is supposed to "celebrate" and recognize the work of faculty and staff. I guess this is supposed to be a more desirable substitute for giving us merit pay raises. You can really tell how much they care. It took a long time for someone to come up with those inane "SMILE" and "ROYAL" acronyms. I don't know whether to feel frightened or depressed about these efforts. I'm not sure, but I think that is my friend Hunter in the center picture. For more educational fun, check out my previous postings on the spelling challenged, active shooters, misguided diversity, and tobacco spitting. This would be much better as a PowerPoint presentation.